Stunning retelling of the story of Jesus healing the official's son from John 4. 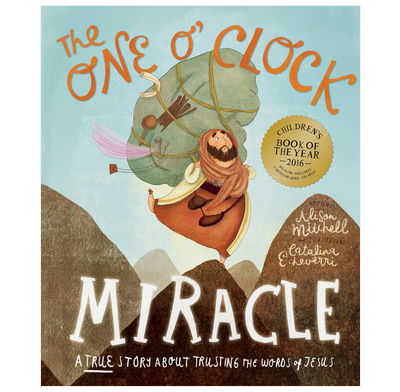 Second in the Tales that Tell the Truth series comes The One O'clock Miracle. 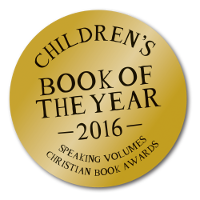 Winner of Children's book of the year at the 2016 Speaking Volumes Christian book awards. Based on the healing of the official's son in John chapter 4, this wonderful storybook will teach children about the instant power of the words of Jesus, and that they should trust Jesus because he is God's Son. I bought this as a gift for my 21 month old goddaughter who loves it! The style of writing is spot on for little ones and really engages them with the story. The illustrations are extremely high quality and there's something new to point out each time. How wonderful to be able to provide a book for her that tells the truth of Jesus, not just moral stories of Piglet and Winnie the Pooh (however wonderful they may also be). This is first class, one of the best children’s Bible stories I have ever read. The pictures are bright, vivid and engaging. The story builds to a beautiful climax and drives home the same point that I think John the Apostle was trying to make. (John was one of Jesus' friends and the man who first wrote down this story in the gospel of John.) The text is well written, with just the right amount of repetition to please a younger child, but not so much it gets annoying for the parent. The text is short enough on each page that the story moves along at a good pace. It has a bright joyful tone that gets across the central shock of the miracle..
My one gripe is that the map shows Cana as being south of Lake Galilee near the Jordan river. There are two possible sites for Cana; both are west of Galilee and nowhere near the Jordan river. Everything else is great: it correctly shows the terrain along the route as being hilly and it gets the length of journey about right. I have two passionately engaged and very short literary critics in my family; the eldest is three and a half years old. They don't like everything, but they like this a lot. I don't like all children's Bible stories, but I like this a lot. I expect to read it many times over the next few years – and I expect to enjoy the experience. Thanks for your review, Paul - I'm delighted that you like the story so much, and especially your comment that it "drives home the same point" that John is making in his Gospel. That's our aim with every book in the "Tales that tell the truth" series. Thanks too for your comment about the precise location of Cana. You are right that, if this was an exact map, Cana would need to be more directly west of the Sea of Galilee. I hadn't noticed that the illustration had moved it further south, so I do apologise for that. As I'm sure you're aware, there is a stylised element to the illustrations, such as the size of the pack the man starts off with, and the near-vertical hill he climbs on the page after the map, which aim to build up the main idea behind each story. This is something Catalina does brilliantly in her artwork, all of which adds to the huge reveal when "Jesus simply spoke". The pictures support the main Bible teaching, and keep the focus centred on the words of Jesus. But if we do include maps in future books in this series, we'll make sure to keep them as accurate as possible.